In 2005 Brad Lidge had 42 saves in the regular season, that’s one more than he had in the magical run that lead him to his first and only World Series ring last year. In 2005, Lidge also had more strikeouts (103 vs 92) and fewer walks (23 vs. 35) compared to 2008. By all accounts, Brad Lidge had a pretty good season in 2005. He wasn’t perfect (4 blown saves) but he was a lot better than solid. He was the kind of closer that gives confidence to every other member of the team. The kind of closer that makes the other team think that, if they’re down (even by one run) in the 9th inning, they can not win. But now, there is only one pitch for which Brad Lidge will be remembered in 2005, only one at-bat that matters. 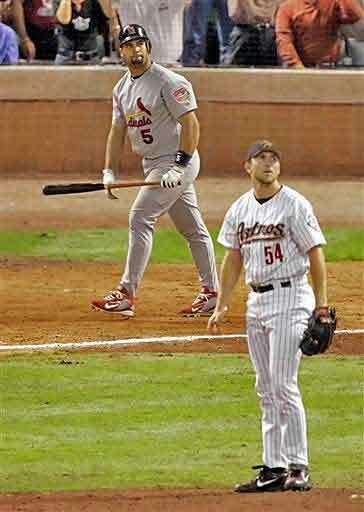 Because on a warm October night in Houston, at the end of game 5 of the NLCS, Albert Pujols owned Brad Lidge. That probably should have been the end of the story. I certainly thought I would never here from Lidge again. And then he ended up in Philadelphia. Baseball is unrelenting. Baseball goes on forever. In Baseball, the ‘modern’ era includes things that happened a hundred years ago. So first Lidge should have been done-in by Pujols’ gargantuan 3-run shot in 2005. But that wasn’t the end. Then I would have expected him to gently ride off into the sunset, perhaps fading to age or injury, after the electric perfection he conjured in 2008. But that was not the end. Like Baseball itself, the story goes on and on. And now, in Philadelphia and Colorado, the next chapter will be written. Lidge was not just good last year – he was perfect. Every time he tried to get a save – he saved it. Every time the team was leading at the end of the game and he was on the mound, his team won. No closer has ever performed better in a single season for the Phillies. Not. Ever. And what has happened in the recently completed 2009 season? The one in which the Phillies return to the playoffs as division champs for the third year in a row? The season when four members of the Phillies everyday lineup have thirty or more homeruns? Brad Lidge has turned in the worst performance by any relief pitcher on any team in baseball this year. He is, statistically, Baseball’s worst relief pitcher. We are well beyond any worthwhile investigation into why this is the case. The only relevant statement is that he is not injured. Which means that the cause of his dizzying, dazzling fall from perfection is a true mystery, especially to Lidge himself. Anyone who says they know what’s going on is wrong. The nature of closing baseball games is such that these horrors happen. In mere hours, the playoff rosters will have to be set, and while skipper Charlie Manuel is mulling some players on the bubble, one of them is not Brad Lidge. He will be on the team, not necessarily because he has earned it with his performance this season, but because he is still better than Escalona and other truly marginal major leaguers. And he won’t be on the roster to play shortstop. Or even come in for the 6th or 7th inning. There is only one thing that Lidge is here to do, arguably only one thing that he is prepared and able to do – close games. Will he be able to flip a switch and feed off the intensity of a playoff situation? Not likely. Not when he’s been so off all year. But there is no solution or alternative. And this is not assured failure, not with home-field advantage in the first round and an offense that can produce runs in bunches. Even if that solid fastball (thrown for a strike) and that magical, disappearing slider don’t come back in full force, Lidge will still be able to get batters out. And he has the confidence and love of his manager – that’s a factor that may not fix the problem, but it can only help. And we Phillies fans will bite our nails and sit on the edge of our seats and try to remember that Lidge was successful during 74% of his save attempts (I would have been happy with a 74 for some of my first-year law school classes). But, as we get ready to go into the playoffs, this is where we live. Because, in a very different way from Albert Pujols on that night four years ago, we all own Brad Lidge. This entry was posted in Phillies and tagged Albert Pujols, baseball, Brad Lidge, closer, relief pitcher by mpomy. Bookmark the permalink.